Text for the booklet included in Florian Hecker’s Urbanomic-commissioned CD Speculative Solution. It is possible to maintain a distinction between the ‘order of ideas’ and the ‘order of history’, whilst admitting that one unfolds within the other in an entirely contingent manner. The objects or situations that occasion or facilitate a certain meditation at a given historical conjuncture operate a selective pressure on thought: Certain turns in thinking can only take place in the company of certain objects, which thereby become instruments of philosophy, and the worldly indices of transformations in the conception of reason itself, the ‘image of thought’. From Pythagoras hearkening to the sounds of the blacksmith’s workshop, to Descartes palpating his lump of wax, the persistence of vignettes recounting such catalyses – both those told by philosophers themselves, and those told of them by others (even those most likely apocryphal) – testifies to our recognition that thought is always provoked by encounters with something outside itself; and our belief that, in passing them on, the imagination will play its part in allowing the thought-experiments of the past to be rehearsed and repeated. This suggests that these catalytic objects are prosthetics for the ‘spiritual exercises’ of which the Stoics spoke. In the Stoic conception of philosophy as technical – ‘an art or craft (techne) concerned with one’s life (Bios)’ a central place is given to ‘the role played by some form of training or exercise (ascesis – training, exercise, practice)’[Sellars]. A philosophical thought must not only be understood but brought into life; thus reason is no stranger to the plasticity of the imagination. Would it not be worth the experiment, at least, of affirming the substantive importance of the instruments of thought, and reviving the Stoic conception, through the creation of a new memento cogito? This is surely a task for artists, those who can bring concepts into the register of intuition through a process of ‘dramatisation’. However, apart from the most simple of concepts (and the most simple of artists) this cannot be a case simply of illustrating or transposing some concept into a material medium. So the question becomes, not only that of reaffirming the participation of reason and the imagination in a common task, and of the works and objects that stimulate them into this task; but also that of understanding the twisted path that leads from one to the other: from the encounter to the concept – and back again, as imagination reacts with concept so as to ‘dye the soul’. 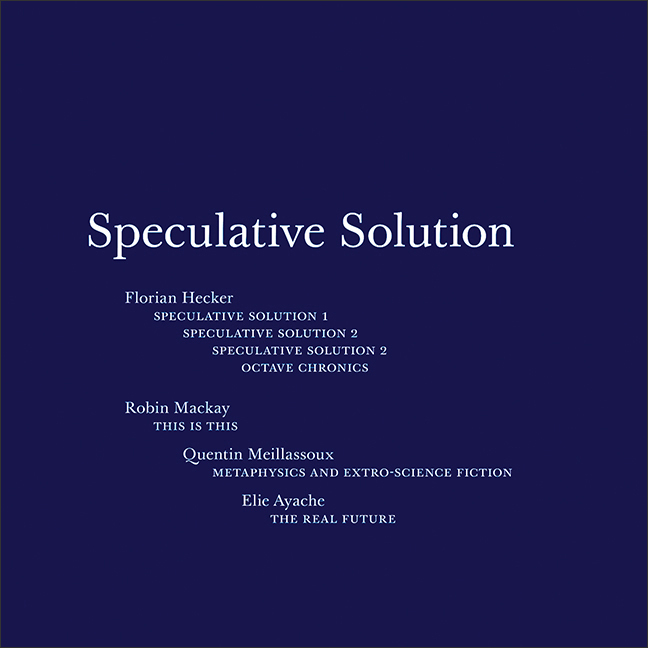 Speculative Solution offers itself as a catalyst for the thinking of radical contingency, participating in a contemporary renewal of philosophy spearheaded by the work of Quentin Meillassoux. But this recent transformation in the image of thought itself belongs to a sequence whose phases are indexed by a heterogeneous set of objects and encounters that have occasioned and reactivated philosophical thought. Imagine that you – a sharp-witted Scottish philosopher – have just arrived in seventeenth-century France, eager to immerse yourself in the shady demi-monde of Parisian gambling dens. Arriving at such an establishment, you loiter nearby whilst a game of dice is played. Unaccustomed to such intrigues, you take the opportunity, unnoticed, to secretly examine one of the dice. Observing its six equally-spaced and equally-sized sides, and concluding that there is no reason to believe it will fall on one side rather than another, decide to adopt as a rule of thumb that any of the six numbers are equally probable to turn up. Armed with this knowledge, you join the game confidently. Over a number of games, and to the apparent amusement of the more seasoned players at the table, your die seems to turn up ‘1’ almost every time. Do you (a) protest loudly that something untoward is at work here, and demand the die be cut open to establish how it has been so ‘loaded’; or (b) conclude that, since your hypothesis has proved useless, and one can evidently know nothing a priori about the outcome of such games, your only remaining options are either to abjectly learn by experience by noting down the results of every single dicethrow, or to just slink off with your pockets a great deal lighter? It is the fundamental thesis of (philosopher and bridge expert) Jean-René Vernes’ book Le principe Pascal-Hume et le fondement des sciences physiques that something like the events dramatized above are at the root of a misprision over the nature of reason that reigned for hundreds of years, and that bequeathed us all the problems of post-Kantian idealist doubt as to the very existence of matter. When I see, for instance, a billiard ball moving in a straight line towards another; even suppose motion in the second ball should by accident be suggested to me, as the result of their contact or impulse, may I not conceive, that a hundred different events might as well follow from the cause? May not both these balls remain at absolute rest? May not the first ball return in a straight line, or leap off from the second in any line or direction? All these suppositions are consistent and conceivable. Why then should we give the preference to one, which is no more consistent or conceivable than the rest? All our reasonings a priori will never be able to show us any foundation for this preference. There is no a priori way to deduce how one ball will react when impacted by another; since any number of outcomes seem equally conceivable, we find no rational basis for the principle of causality. According to Hume, we must then abandon the ontological quest to locate a principle of causality in things; and consider instead the psychological reason why we believe one to exist (according to Hume, because of our habituation to certain ‘constant conjunctions’ of phenomena). According to Vernes, Hume’s reasoning begins with a ‘classical’ model of reason, the essential characteristics of which are modeled on the certainties of geometry: just as one geometrical proposition necessitates another, so a present event necessitates a future event. Hume has demonstrated that, whereas geometrical reasoning may proceed a priori, the principle of causality can only ever be an hypothesis, a demand made by the Principle of Sufficient Reason (that ‘everything must have a reason to be as it is rather than otherwise’). In doing so, he questions the authority of the latter principle, destroying the parity between geometrical reason and physical explanation that classical reason believed was exhibited in the predictability of the billiard ball’s angular course. Hume destroys the image of rational thought, and discovers a rationality that, untethered from sufficient reason, now wanders so deliriously that it must be supplanted by a more modest, psychological account. Vernes now introduces a second philosophical vignette, that of the birth of the philosophical thinking of probability. In 1654 Pascal was supposedly asked by his friend, the Chevalier de Méré, to advise him on tactics in a game of dice. Pascal formed the a priori conviction that each side had an equal probability of turning up; that what is equally thinkable is equally possible. According to Vernes, in this ‘a priori law of probability’ Pascal discovers a new, broadened image of reason: a probabilistic rather than a necessitating reason. So, if the catalyst for Hume’s philosophical reasoning had been a game of dice rather than a billiards match, he would discovered the a priori law of probability. Subsequently, in noticing that the balls always in fact seemed to interact in the same way, he would have suspected that reality was ‘loaded’ – that there was something hidden in things that accounted for the disparity between their behavior and this a priori principle. This ‘something’ is what we call matter. Dice-wise thinking (probability) leads to a rational materialism, where billiardian thinking (geometry) leads, through classical rationalism, to a wholesale renunciation of reason and a limitation of philosophy to thinking on the human, psychological side of things. So that, according to Vernes, if Hume had played dice, we could have avoided the great rupture between philosophy (unable to convince itself of the extra-phenomenal reality of matter, and falling back on an examination of mere phenomena) and science (continually cutting reality open to discover how it is ‘loaded’). Stimulated by Vernes’ thesis, Quentin Meillassoux spent many years stalking slowly around Hume’s billiard table, examining over and over that one moment when Hume freezes their dynamic interaction in its tracks, to enumerate all the imaginable outcomes. He pondered whether this moment could really be equated with the moment when the dice have just been rolled, when the roulette wheel is yet to settle. Cinnabar versus billiards … Kant adumbrates this scene entirely with the aim of showing that it would be impossible to experience or even imagine. If there is experience, Kant argues, this in itself proves that natural laws are constant; for if they were not, in all probability they would change with absolutely discombobulating rapidity, and all coherent experience would be impossible. Meillassoux refuses Vernes’ conversion of Hume’s imaginative vignette – from that one moment when the impact of the balls could occasion any outcome (or none) – into a transition from multiple possibilities to single actuality, between the rolling of the die and its settling on one face. He refuses equally Kant’s amplification of its instability, its depiction of the absurd impossibility of thinking the constancy of natural laws as a game of chance. For Meillassoux, reason is indeed the very same faculty as imagination, whose capacity to imagine different outcomes exceeds those that come to pass in reality; but for Meillassoux it also exceeds any probabilistic circumscription. We cannot imagine the universe as a die, whose many faces pre-exist its ‘fall’ into actuality. There are more things in the universe than probability theory can dream of, and this in a very precise sense if we think it according to the mathematical theory of the transfinite, according to which the subset of an uncountable infinity is itself an infinity, making probabilistic reasoning impossible. If we think contingency, we must think radical contingency rather than chance. There are no constant laws of nature, and anything could happen (or not) at every moment. No dice. In that case, what happens to the encounter with matter precipitated by Vernes’ conversion of billiards into dice? Doesn’t Meillassoux rob us once again of the materialist hypothesis? What have we left that is solid to hold on to? Precisely, suggests Meillassoux, that vanishing moment between the impact of the billiard balls and the innumerable different courses they might take. At this moment, it will be remembered, Hume conceded that, reason being unable to guarantee a priori any certain outcome, we must content ourselves with a psychological law, not a law of reality. It is in following Hume, but in contemplating this moment with an increased intensity of purpose, that Meillassoux grasps this moment positively. The ‘failure’ of reason to justify the thesis of constant laws of nature is a bona fide ‘intellectual intuition’ upon whose a priori basis alone we can hope to understand why the physical world is as it is rather than otherwise (which it now has every right – unconstrained even by probability – to be). The foundation of science, and its reunion with philosophy, will proceed, not through an empirical dissection of the ‘loaded dice’ of nature, but through a concentration of its principles around this one singular point, this expansive moment of intellectual intuition, the moment of radical contingency. where laws are abolished pure and simple, where everything and anything can happen, for no reason whatsoever, at any moment. Hume’s discovery having been awarded its properly positive status, reason reveals the absolute necessity of this ‘hyperchaos’ which underlies all apparent constancy of natural laws. This necessity is not (as in classical rationalism) the absolute necessity of some (divine) entity that would guarantee all others, but a necessity-without-entity that eternally dissolves all guarantees. This is something very difficult to think, and to draw the full consequences of. As Meillassoux points out, the attempt to carry out this task of reason is also as a task of the imagination; one that may proceed through the development of an ‘extro-science fiction’ imaginary, which is the task of imagining a world founded on radical contingency – our own. Elie Ayache has made this task of the inhabiting of radical contingency his own. And he claims to have discovered for this moment of radical contingency a worldly medium: the market of contingent claims. Ayache argues that, whereas academic theories of valuation claim to calculate price as the output of a probabilistic function, in the reality of the trading floor price is affected at every moment precisely by such calculations and by their continual recalibration. Indeed, exchange as such, and thus pricing theory, only make sense in so far as one knows oneself plunged into a future that is written only through the very anticipation of the actual reality of its future contingency. Thus, as Ayache states, the disparity between these theories and the reality of the market stems from their importing an ill-fitting model from elsewhere – from the roulette wheel rather than from the strike of a call option. This model leaves no room for the very reality of the market, that reality without which price would not even be a problem. ‘Mistaking an XSF problem for a SF problem’, theories of the market exclude its contingency (its exposure to infinite other situations including its own representations of itself) from their account in order to make a ‘good story’. We should be careful not to reverse the priority here: it was the market that delivered Ayache to a meditation on what it means to inhabit contingency – an order of events indexed by price, which cannot be pre-encapsulated within any framework of multiple possible worlds (faces of the die) and in which one plunges oneself at every moment back into that vanishing moment, that space beyond possibility, between the impact of one billiard ball and the reaction of another, when ‘a hundred’ (Hume) or transinfinite (Meillassoux) ‘different events might as well follow’. The reconceptualisation of pricing software his team had embarked upon, in order to rectify the shortcomings of pricing theory’s SF imaginary, met coincidentally an apt philosophical thesis when Ayache happened upon Meillassoux’s work. A happy accident that has resulted in a promising philosophical project that discovers a startling superposition of the arcane lexicon of the derivative, strike, smiles and dynamic replication with some fundamental philosophical problematics; and which in turn lends to those problematics a certain real-world urgency. For here, the future is subtracted from the ‘morbidity’ of prediction and probability, which reduces the production of the future to a calculable selection from pre-existing states. And this subtraction is what opens our world onto the truly contingent, beyond our calculations of risk and reward; and it is this that we need to think. To return to our original inquiry, how might Hecker’s composition rejoin the weird cast of philosophical prostheses that have presided over this sequence in the recent history of philosophy? What kind of thinking can sound occasion, what kind of spiritual exercise can it enable? In hearing, we are constantly making an ‘additional effort’ to derive a ‘state’ from a raw material. This raw material ‘strikes’ us as nothing other than what it is – pure difference in intensity. This is its proper difference and its contingent character, something that is at once the very element of hearing, and that which can never be heard (what Deleuze would have called the audiendum). Hecker’s psychoacoustic experimentation focuses attention on the active role of the imagination in constructing objects from the raw material of sound according to what can easily be described as probabilistic calculations. These are calculations whose ‘priors’ are bequeathed to us by evolutionary imperatives and cultural conditioning. In its utilization of heterogeneous ‘metaphysics’ and its limning of the extremities where their articulations of sonic material break down, Hecker’s work tends toward a minimalist or literalist presentation where objects yield and we stand on the threshold of the proper being of sonic sequences, confronted by what they are and nothing more. In such moments the stratified systems that allow us to ‘vertically’ differentiate different temporal scales and ‘horizontally’ operate protentions and retentions that ‘make sense’ of sound, melt down into a ‘pure chronics’ that parallels Meillassoux’s hyperchaotic theory of time. But of course a ‘sonification’ of hyperchaos – a description, within a finite work, of what it would be to live in a hyperchaotic world – is impossible. To mime an ‘extreme unpredictability’ would be totally to miss the point: which is not to plunge the listener into a state of chaotic change, or total flux. Nor to expose them to the operations of chance. Chance, like change and stasis, can only ever be an inifinitesimal quotation from hyperchaos, which, as Meillassoux is at pains to point out, can sustain apparently endless and stable periods of constancy as much as infinite periods of furious change. Hyperchaos cannot be a genre, style, state, or entity: it can only be an inhabiting of a moment neither quiet nor loud, harsh or gentle, chaotic nor calm, organic or inorganic, ordered or disordered. To live the moment of hyperchaos it is necessary no longer to think in terms of necessary entities, but to move towards a necessity-without-entity. If Hecker’s practice and the concept of hyperchaos – of a world where one can only hold on to ‘a chronics of things’ – appear ‘made for’ one another, the more superficial ways in which this seems to be the case must be peeled away to harbour more profound conceptual connections that require an additional effort of thought. The ambitious stakes of Speculative Solution involve an ironic performative use of Hume’s principle of habituation in order to Meillassoux’s undoing of the error that gives rise to this principle: a spiritual exercise that employs the mechanisms of the imagination in order to deliver them to their proper element, without image, which is also that of reason. Thus ‘converted’ by repeated aural administrations, dyed by the colours of extro-scientific fantasy, such a gaze might even ‘read’ this text in a transformed manner: no longer as a didactic philosophical description (whose thematic nature would now be obsolete), but as a minimal encounter with marks on paper, truly ‘literalist’ marks which have no reason to be as they are, which could have been – and still could be, at every moment – otherwise; only this stripped-bare gaze can complete the whole assemblage, as a work whose future writing (as Duchamp ‘predicted’) will continue to exercise the viewer/listener. A notable and honourable exception is an exercise described by Paul Churchland to put the counterintuitive insight of Copernicanism ‘into observational gear’.